You can use handholds for balance, to help raise yourself by pulling up on the hold, or to provide various forms of counterpressure. Fig. 9-8. 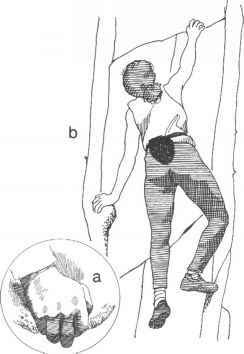 Downpressure: a, using heel and palm of hand; b, used in combination with other holds. be useful on very small holds. Holds are often used as cling holds from below, then as downpressure holds as you move above them. Downpressure holds may be used by themselves or in combination with other holds (fig. 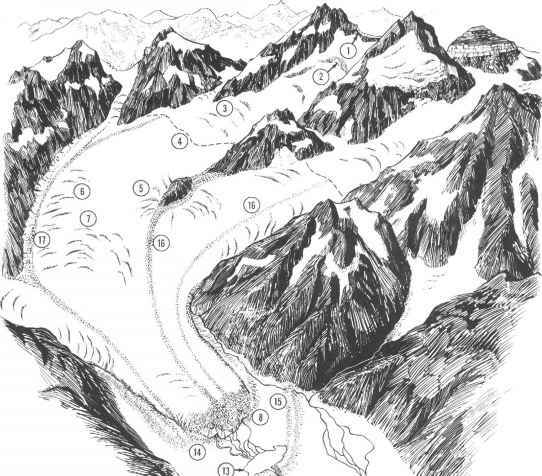 9-8b), such as in counterforce with a lieback hold, or as part of a stemming move. With your arm extended and elbow locked, you can balance one-handed on a downpressure hold as you move the other hand to the next hold.